Due to its possession of Siberia, Russia has the distinction of being both the world’s largest country by area and, by some measures, the coldest country. 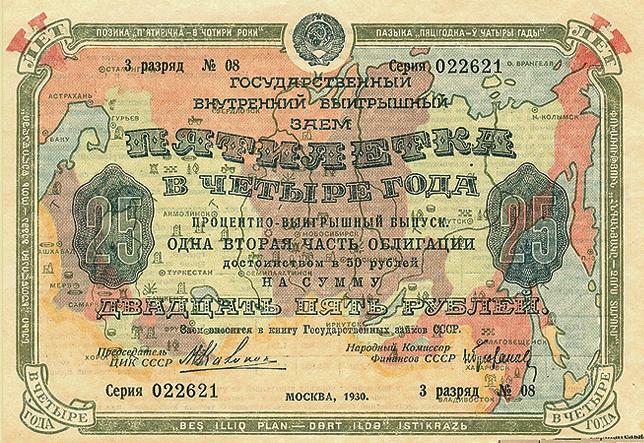 While Russia has for centuries been proud of its vast expanse and its frigid winters, some analysts both in Russia and abroad now see these two attributes as liabilities rather than assets. Whether Russia can harness its size and adequately adapt to its climate will likely determine the future of Siberia and of Russia as a whole, influencing as well the overall geopolitical balance of powers in the world. Fiona Hill and Clifford G. Gaddy of the Brookings Institution addressed these issues in their 2003 book The Siberian Curse: How Communist Planners Left Russia Out in the Cold. While their suggested solution for Siberia’s—and Russia’s—development is highly controversial, their arguments and conclusions are worth examining, as are some of the issues they overlooked. The remainder of this article will outline Hill & Gaddy’s arguments; problems with their account and additional issues will be explored in my forthcoming posts. Russia’s daunting proportions and its cold winters lie at the very core of its popular conceptualization, but some mind-boggling facts are worth repeating. Russia in its different permutations (Russian Empire, the Soviet Union, the Russian Federation) has been the world’s largest contiguous state for at least four centuries. If Siberia were independent, it would have the largest area of any country in the world—by a significant margin. 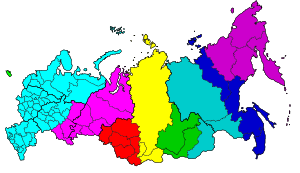 Russia as a whole spans nine time zones, seven of which are in Siberia (see map). * Even after the breakup of the Soviet Union, Russia still has more neighbors and more international land borders than any other state, except China. Russia’s natural resources are plentiful—40% of world natural gas reserves, 25% of the world’s coal, diamonds, gold, and nickel, 30% of its aluminum and timber, 6% of global oil, and so on—and most of these holdings are found in Siberia. 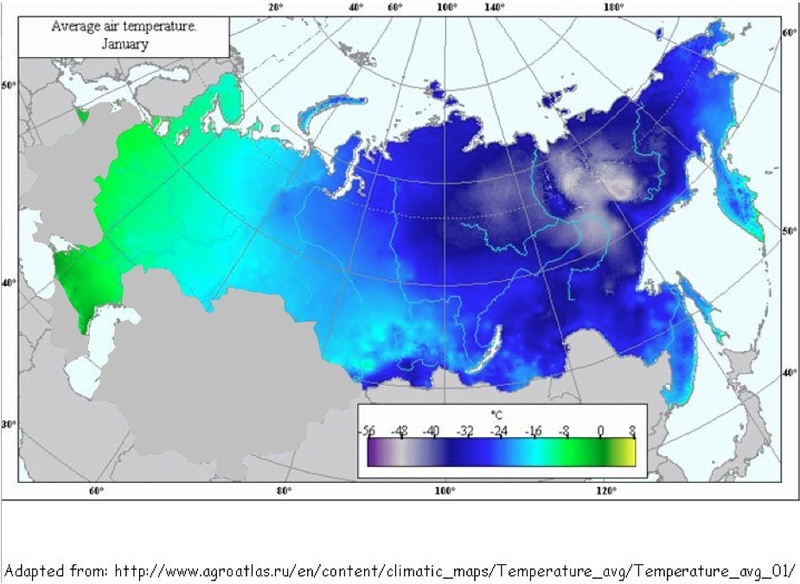 And by most conventional measures of temperature, Russia is the coldest country in the world: “it has twice as much territory above the Arctic Circle as Canada, ten times as much as Alaska, and fifteen times as much as Norway, Sweden and Finland combined” (Hill & Gaddy, p. 233). Again, if Siberia were an independent country, it would claim the distinction of being the world’s coldest, with mean January temperatures ranging between -15° C and ‑45° C (5° F and ‑49° F). The world’s lowest temperature outside Antarctica, ‑68° C (‑90.4° F), was recorded three times: “in Verkhoyansk on February 5 and February 7, 1892, and in Oymyakon on February 6, 1933. Both locations are in the Republic of Sakha (Yakutia) in Siberia” (Hill & Gaddy, p. 233). Siberia’s cold does not derive wholly from its northern location, as southern Siberia lies at roughly the same latitude as southern European Russia; Vladivostok, the largest city of the Russian Far East, is located 22° south of Moscow. However, unlike most of North America, where winter isotherms—that is, lines of constant temperature— run east to west, in Russia the isotherms run more in a north-south direction (see image). As a result, winter conditions do not get colder from south to north as much as they do from west to east. For example, Saint Petersburg is warmer than Moscow, even though it is 400 km further north. A hypothetical traveler who begins a journey in Moscow in January and proceeds due east would, without ever moving farther north, enter progressively colder and colder zones. “By the time the traveler approached Russia’s Pacific coast, that person would not only have covered nearly 7,500 kilometers but would also have traversed a temperature range of more than 20° C” (Hill & Gaddy, p. 33). Similarly, while Tromsø (Norway) and Norilsk are on the same latitude, the difference between the two cities’ mean February temperatures is 30° C (55° F)! For centuries Russia’s size has been seen as its main source of wealth and power. Already in the sixteenth century, Russian rulers were pleased to learn that their country’s territory was larger than the surface of the moon (Richard Pipes, Russia under the Old Regime, p. 84). The cold too has given the Russians a certain sense of invincibility, as they got accustomed to viewing it as a strategic resource. The first sighting of “General Winter” on the Russian soil was in 1707 during the Great Northern War that Charles XII of Sweden fought against Russia’s Peter the Great. That winter was the most brutal of the eighteenth century across Europe—even the salt-water port of Venice froze—but conditions in Russian were worse than what the Swedes had expected. The number of Charles’ troops, drawn by the Russian retreat deeply into the country, nearly halved: by spring only 19,000 out of 35,000 troops remained. The Russians used the same retreat-and-wait-for-the-winter policy in both Patriotic Wars: in 1812-13 and again in 1941-1945. When Napoleon’s Grande Armée of 610,000 men invaded Russia in 1812, the Russian army retreated, burning crops and villages. As a result, starvation, disease, and then the cold caused more casualties than the actual military engagements. Losses were especially severe during the humiliating retreat of the French, which started on October 19, just days before the first severe frosts and less than three weeks before the first snow arrived. 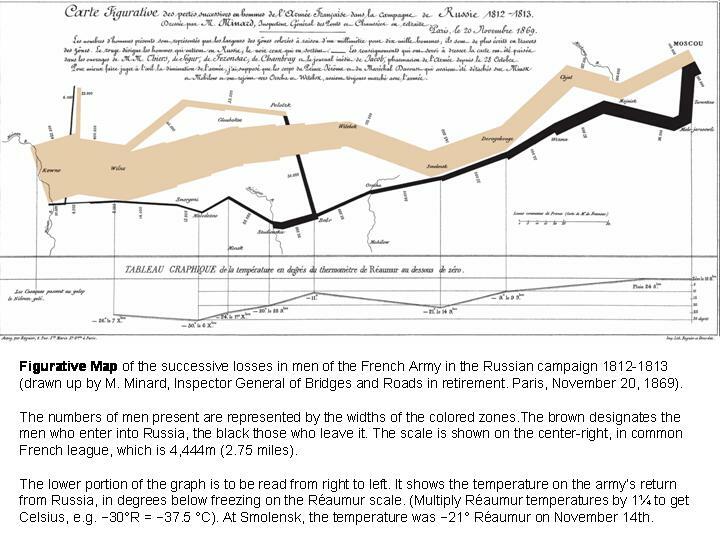 As can be seen from the figurative map on the left, fewer than 50,000 French troops made it out of Russia. History repeated itself during World War II, when the Russians again retreated, adopting a scorched-earth policy, and waited for the cold and snow to entomb the Nazi army whose plans for a quick summer victory precluded proper preparations for a Russian winter. Sure enough, the Germans were forced to withdraw from much of the territory they had captured. Subsequent winters proved a challenge as well: “in November 1942, the German Sixth Army was encircled and trapped during its siege of Stalingrad on the banks of the Volga River. Three months later, in February 1943, with its 250,000 men starving and freezing to death in temperatures of -30° C [-22° F], the Sixth Army finally surrendered—Germany’s first major military defeat in World War II” (Hill & Gaddy, p. 27-28). But Russia’s other wars showed quite clearly that its size can be a liability rather than an asset. The difficulties of mobilization and transportation contributed greatly to Russia’s defeat in the Crimean War in 1854-56. Half a century later, during the 1904-05 Russo-Japanese War, the main Russian fleet needed nine months to sail the 30,000 kilometers from its home base in the Baltic Sea to the Far East, where it was promptly blasted from the water by the Japanese navy at the Battle of Tsushima Strait. By then, the construction of the Trans-Siberian Railway was almost complete, but the route extended for more than 9,000 kilometers, was only single track, and was missing a vital section around Lake Baikal. The vulnerability of the Trans-Siberian Railway in 1905 is the linchpin of Boris Akunin’s acclaimed 2003 historical mystery novel The Diamond Chariot. These two defeats—in 1856 and in 1905—led to major upheavals of Russian history: the abolition of serfdom in 1861 and the Revolution of 1905. They also underscore the true problem with Russia’s size: over such vast distances, effective transportation is extremely difficult. 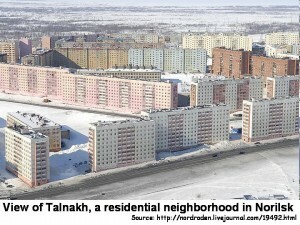 A GeoCurrents post highlighted the transportation limitations of Yakutsk, a regional metropolis of more than a quarter million inhabitants that is connected to the rest of the country by a “highway” that is often impassible. But the situation is similar all across the country; as the popular Russian adage goes, “there are two main problems in Russia: fools and roads”. Fiona Hill and Clifford G. Gaddy discuss in detail another way in which Russia’s size is detrimental to its economy: “the primary issue is not just Russia’s physical expanse, but where people are located within that space” (Hill & Gaddy, p. 7). According to their figures, the population density of Siberia is ten times less than that of the United States. Compounding the thinness of settlement is the fact that, most of the inhabitants of Russia, and especially of Siberia, live in cities. However, these cities do not follow the “natural” rank-order population distribution described by Zipf’s Law, which runs as follows: “a country’s largest city is approximately twice as large as the second-largest city, three times as big as the third city, four times as large as the fourth, and so on” (Hill & Gaddy, p. 19). 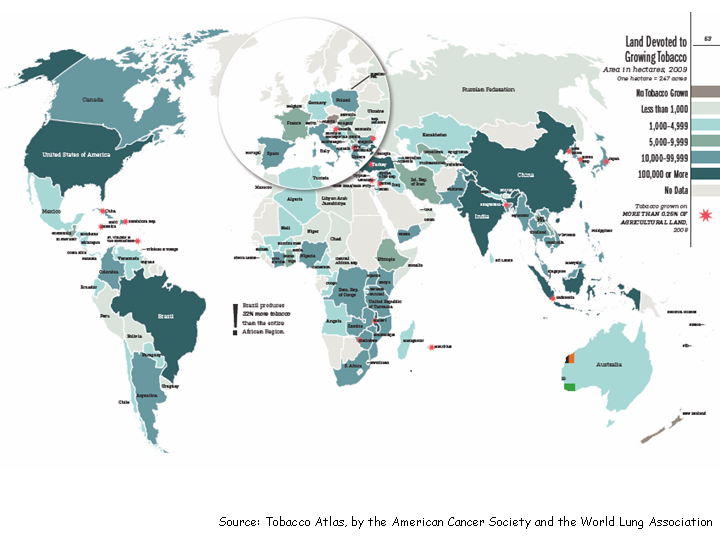 In most other countries, if Zipf’s Law is violated it is only because the country’s largest city is “too big.” Examples of such “primate cities” include Paris and Dublin, Mexico City and Buenos Aires, Kabul and Bangkok. ** Russia’s two largest cities—Moscow (population 11.5 million) and Saint Petersburg (population 5.1 million)—fit the Zipf pattern. However, the third-largest city, Novosibirsk, has population of only 1.4 million, and is thus oddly small. Altogether, ten cities in Russia are crowded into the population range extending between 1 and 1.5 million people: Novosibirsk, Yekaterinburg, Nizhny Novgorod, Samara, Omsk, Kazan, Chelyabinsk, Rostov-on-Don, Ufa, and Volgograd. The urban areas between 1.5 and 4 million people, predicted by Zipf’s Law, are conspicuously absent. 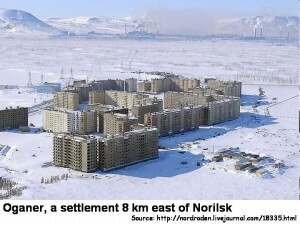 This deviation from the norm derives from the fact that most of Russia’s urban areas did not naturally grow from villages to towns to cities; instead many were created or at least enhanced artificially, Frankenstein-style, in the Soviet period, when planners dictated development based on natural resource exploitation or industrial production needs (see image). Many of these cities were built by Gulag prisoners or other forcibly resettled groups. The transportation and institutional connections among those cities were also dictated solely by the need to extract and process natural resources. Moreover, strict registration laws controlled the population of these cities; in the so-called propiska system, citizens had to register their place of residence with the local police. (In many cities, including Moscow, such regulation are still enforced). According to Hill and Gaddy, such processes resulted in “too many” second- and third-tier cities, which were created by Soviet planners “in their attempt to nominally fill the space from the Urals to the Pacific” (p. 21). In fact, 28% of Russia’s 300 largest cities are located in Siberia. Soviet policymakers defied not only the economic logic that governs the location and size of urban centers, but they also failed to meet the challenge Siberia’s frigid climate, largely by constructing buildings that were difficult to heat. Concrete walls were thin and poorly insulated, with single-pane windows often nearly covering whole walls. 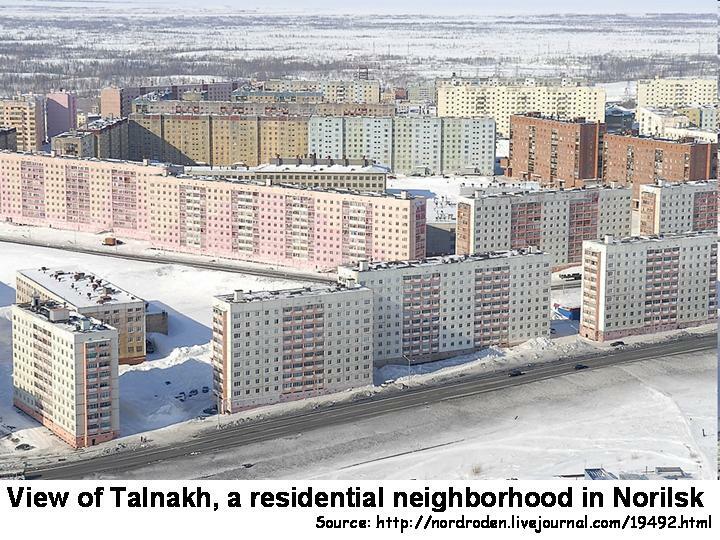 Residential neighborhoods were typically built on a grid model, with straight lines of relatively tall blockwork buildings artificially creating wind tunnels, further increasing heating costs (see the image on the left and the view of Norilsk from my earlier post). But heating represents only a small part of the overall costs associated with Siberia’s frigid climate. Cold reduces the ability of both people and machinery to work efficiently and safely. When the temperature drops below certain thresholds, disastrous damage can be caused to buildings, equipment, and infrastructure: at ‑15° C (5° F) high-carbon steel can break and car batteries must be heated; at -25° C (-13° F) unalloyed steel begins to break and frost-resistant rubber is required; at -35° C (-31° F) trestle cranes fail and some tractor shoes break. According to geographer Victor L. Mote, who in 1983 documented the difficulties to living and working in Siberia, “the number of breakdowns of standard equipment was three to five times greater in Siberia than in more moderate regions” (cited in Hill & Gaddy, p. 50). Human beings are affected by the cold even more than machines: “There is a noticeable drop in labor productivity for outdoor work when temperatures fall below 0° C [32° F] … Once the temperature drops to -20° C [-4° F], warm-up breaks of 10 minutes per hour for each seven-hour work day are imposed… In an average year, total losses to cold comprise 33 percent of all possible working time in the Soviet North” (Hill & Gaddy, p. 50-51). Given that Russia’s size, cold, and disconnectedness are hardly questionable, what solutions do Hill and Gaddy propose, and what direction has the Russian government taken in its policy on Siberia? These questions will be considered in the following post. * Most of European Russia corresponds to the same time zone, the only exception being the Kaliningrad exclave, which is one hour behind Moscow time. Prior to 2010, there were eleven time zones in Russia, of them eight in Siberia. **Bangkok is known as “the most primate city on earth”, being forty times larger than Thailand’s second city.